ICIMODs celebration of World Environment Day this year focuses on forests, in recognition of the International Year of Forests 2011. According to the Food and Agriculture Organization of the United Nations (FAO), some 13 million hectares of the worlds forests are lost each year, including 6 million hectares of primary forests, which are considered biologically the most diverse ecosystems on the planet. The International Year of Forests is intended to increase awareness about the importance of forests as an integral part of the sustainable development of the planet and about the economic, socio-cultural, and environmental benefits that forests provide. Deforestation and forest degradation contribute up to one-fifth of greenhouse gas emissions, a major cause of global warming. Forests cover approximately 25% of the Hindu Kush-Himalayan region, and as a varied repository of biodiversity and biomass they epitomise multi-functionality. As part of a wider ecosystem, forests deliver a wide range of goods and services including water, food, household energy, timber, biodiversity sustenance (including wildlife) and mineral resources, besides providing opportunities for recreation and spiritual renewal. 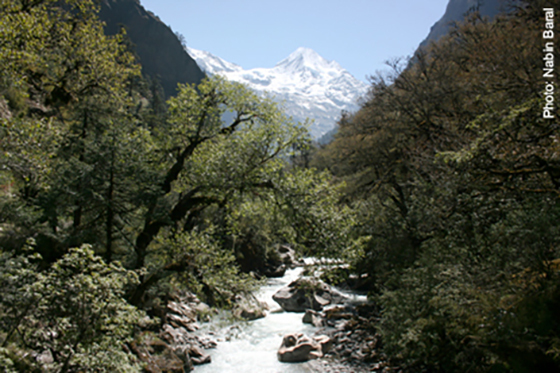 Thus for the Himalayan populations, forests are a source of livelihood and cultural identity. They have a use for many species, some for food, some for local income generation, some as cultural symbols  so for these people, forest biodiversity matters. Furthermore, the role of forests in adapting to and mitigating the impact of climate change is increasingly being recognised. building a regional repository and forum of knowledge on forest ecosystems in the Hindu Kush-Himalayas and facilitating exchange of learning between regional policy and decision makers, researchers, and practitioners. As part of this years World Environment Day, therefore, ICIMOD has planned several knowledge and advocacy events such as youth debates, street drama, promotion of herbal gardens, an essay competition, exhibitions, and workshops on forest and climate change in the Eastern Himalayas and on the role of forests in the new generation of watershed management. We hope that the day will elevate awareness and consciousness among the public and motivate young people especially to recognise the invaluable goods and services provided by forest ecosystems across the Hindu Kush-Himalayan region and to advocate for securing and sustaining them.